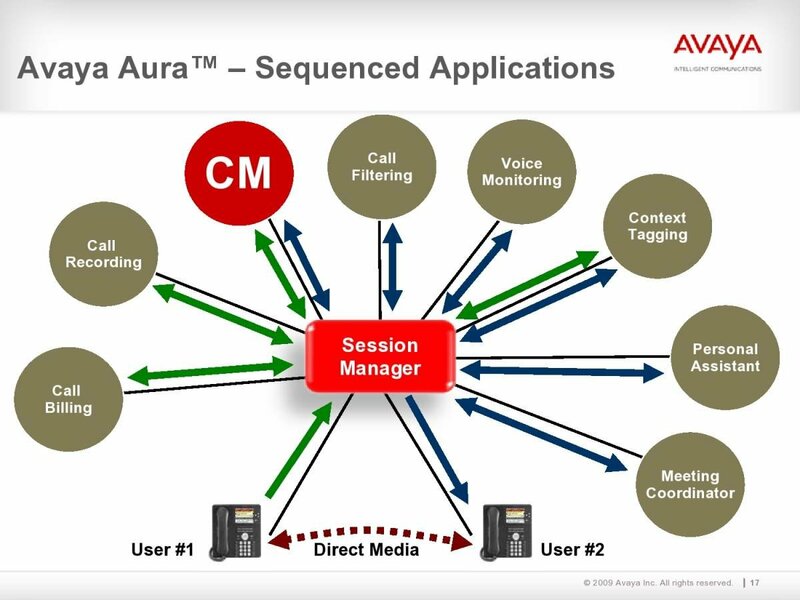 This primer details how Avaya's Aura™ Session Manager and application sequencing works. Avaya's application sequencing is a core feature for creating and enhancing unified communications and communications-enabled business processes (CEBP). In May 2009, Avaya launched its Avaya Aura architecture and related products. One of the key components of the Avaya Aura architecture is a product called Session Manager, which is a carrier-grade application that uses Session Initiation Protocol (SIP) signaling and IP Multimedia Subsystem (IMS) principles to enable communications among the IP network, the circuit-switched network and other applications. One of the key new features of Session Manager is a capability called "application sequencing." Application sequencing is a feature that is unique to Avaya Aura. It handles the sequencing of applications that are invoked from Avaya Aura on behalf of users. Avaya's Aura Session Manager contains all of the logic as to which applications are sequenced for each user or group of users, and then application sequencing invokes them. In essence, application sequencing is the routing engine for the SIP sessions, adding applications into the session before completing the setup of the session. This is a valuable feature that enables unified communications (UC) services to be applied to any user over any network on any device. The unified communications application that most commonly invokes sequencing is IP telephony, but application sequencing works with other SIP-based applications such as video and instant messaging. An enterprise user initiates an outbound call. Session Manager invokes the originating side applications that are associated with that specific user. The applications will be sequenced based on predetermined rules. As part of the sequence, Session Manager sends the call to a CTI-based application, perhaps to deliver an informational screen pop to the user's PC or Web-enabled device. Next, a compliance application such as call recording or a do-not-call database may be engaged. This process is then repeated until all of the required applications in the sequence have been applied to the call. The applications that can be sequenced are, for instance, call recording, CTI-based applications, a database for lookup or potentially any application that can be created by Avaya's DevConnect community. Use of application sequencing UC services can be applied, scaled down, to an individual worker and can be based on time of day, the user's location, who the call is from, and so on. So this allows a call or instant message (IM) to be optimally routed based on a company's business process -- a key to an organization's developing a communications-enabled business process. Click to image above to view the graphic in its full size. A few questions regarding application sequencing have come up that I would like to address as well. ... Application sequencing, which is based on IMS principles, is a novelty in the enterprise. Application sequencing is based on SIP and IMS standards and is thus inherently multivendor. However, since a sequenced application must read and modify SIP messages in a particular way, such applications must be specifically designed or modified to be sequenced. It is how the application handles SIP signaling, rather than the nature of the application itself, which determines whether or not it can be sequenced. At the present time, application sequencing, which is based on IMS principles, is a novelty in the enterprise space. But since it offers a more flexible methodology than traditional CTI for binding applications to users, it has many advantages going forward. How does Nortel's ACE (Agile Communications Environment) fit into application sequencing? Nortel's ACE (Agile Communications Environment) is now part of the Avaya Aura architecture. Currently, SIP sessions originating from or going to ACE could have sequencing applied to them by Session Manager. Also, a sequenced application applied to a user on Avaya Aura might trigger another application enabled via ACE (using Web services, for example). This could be used to "bridge" applications residing on separate networks, such as CTI applications written for other vendor PBXs or platforms. For example, the BlackBerry application developed for ACE could be one of the third-party applications brought into the sequence. In my opinion, ACE was one of the crown jewels for Avaya in the Nortel acquisition. It gives Avaya a great software platform for Avaya's DevConnect community to develop, and it offers broad multivendor support. Since one of the stated goals of Avaya Aura is to interconnect multivendor networks this is going to be very important. Over the next few years, I expect to see many ACE-based applications developed by the DevConnect community creating real business value for customers that go down the Aura route. What are the main risks associated with application sequencing, and how can risks be mitigated? The biggest risk that I can see in application sequencing is having a call or UC session get "lost" because the applications were not sequenced correctly. It's certainly possible to build a set of rules that sequences a set of applications that doesn't make sense so the call never gets to where it's supposed to go. The best way to avoid this pitfall is to ensure that a competent integrator is involved with the deployment. I would recommend working directly with the professional services group at Avaya. I think it's a new enough concept that I would want a single throat to choke if it did not work properly. It's a very powerful technology, but it could cause an organization a lot of pain if not implemented correctly. To get around this, Session Manager allows the differentiation of applications that "must" be successfully invoked as part of a sequence versus those that are "optional." Avaya is also in the process of creating resources for developers writing sequenced applications or modifying older applications to support the new paradigm. The development of sequenced applications will probably become easier in the near future, and the creation of such apps by ISVs, SIs and even end customers is probably not very far off. In summary, I think Aura Session Manager and application sequencing coupled with the investment that Avaya has made in its developer environment (DevConnect) will help customers realize a higher level of value for UC than just bringing all the UC applications under one umbrella. Application sequencing is a core feature for creating communications-enabled applications and business processes. About the author: Zeus Kerravala, distinguished research fellow, leads the Research Council and is chartered with the responsibility of providing thought leadership to the research organization. Comprising senior research leaders, the Research Council provides outreach to clients and the broader Yankee Group community, as well as ensuring that the company's research agenda addresses the needs of business leaders. Kerravala drives the strategic thinking of the research organization and helps shape the research direction. Much of his expertise involves working with customers to solve their business problems through the deployment of infrastructure technology. Before Yankee Group, Kerravala was a senior engineer and technical project manager for Greenwich Technology Partners, a leading infrastructure consulting firm. Earlier, he was the vice president of IT for Ferris, Baker Watts, a mid-Atlantic brokerage firm, deploying corporate-wide technical solutions to support the firm's business units. Kerravala was also an engineer and technical project manager for Alex. Brown & Sons, where he was responsible for technology related to the equity trading desks. Kerravala holds a B.S. degree in physics and mathematics from the University of Victoria in British Columbia, Canada.